OCTOBER’S RECIPE comes from Chef de Cuisine Santiphap Petchwao at Suan Bua Thai restaurant at Centara Grand at Central Plaza Ladprao Bangkok. River prawns and clams are hugely popular. 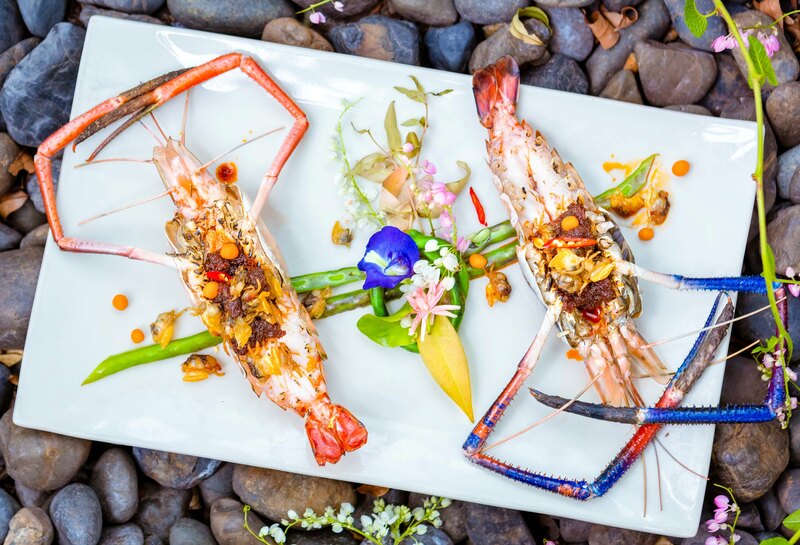 The sheer size and quality of the river prawns make this dish a delicious surprise – and it has become one of Suan Bua’s favourite recipes because of its vibrant flavours – fiery hot and briny, with sharp aromatic notes from the kaffir lime leaves. The dish can be simply prepared with only a few key ingredients: Thai red curry paste, fresh kaffir lime leaves, and salty eggs. Other main ingredients: River prawn; 40g of clam meat; 3 Tbl spoons of red curry paste; 2 Tbl spoons of palm sugar; 1 Tbl spoon of fish sauce; 2 salted egg yolks cooked; one-quarter of a Tsp of a kaffir lime leaf; 20 g of string beans; 2 pieces of Butterfly pea; 3 Tbl spoons of cookinTbl spoons of palm sugar; 1 Tbl spoon of fish sauce; 2 salted egg yolks cooked; one-quarter of a Tsp of a kaffir lime leaf; 20 g of string beans; 2 pieces of Butterfly pea; 3 Tbl spoons of cooking oil; 2 Tbl spoons of dried shrimp; and 2 pieces of coral vine flower to garnish. First, deep fry the clam meat until crispy. Stir-fry the red curry paste in a wok with cooking oil for around 5 minutes; add the plum sugar, 1 salted egg yolk, the dried shrimp, fish sauce and the kaffir lime leaves, which will add colour and complement the distinct, sweet flavor of the prawns. Clean the prawn. Grill the prawn over charcoal for 3 minutes. The prawn meat become white and more firm. Sauté the crispy deep fried clam meat with the red curry paste sauce and pour over the river prawns. After that, add some garnishes– the boiled string beans, fresh butterfly peas and a salted egg yolk roll. The final touch: a fresh coral vine flower. Suan Bua, means “lotus garden” in Thai and is a signature Thai restaurant of Centara Hotels & Resorts. The menu combines Thai-home style cuisine and regional specialties that are innovative in approach and presentation. Suan Bua is located at Centara Grand at Central Plaza Ladprao and will have a soft opening on Nov. 20, after a major renovation, revealing a fresh new interior that is modern with classic Thai elements. For more information about Suan Bua or to make reservations, call 02-541-1234 Ext. 4151.